Maybe it’s because the weather is only tolerable for three months out of the year, but Boston is sorely lacking in al fresco dining nachopportunities. So when we found out that the Rattlesnake Bar and Grill has a roof deck, we were there in a New York minute (after all, we did have a guest reviewer visiting from Brooklyn). While the view wasn’t exactly scenic (unless your idea of scenery is brick walls), we did enjoy the fresh air, cool breeze, and the Nacho Mama’s Nachos, with steak. 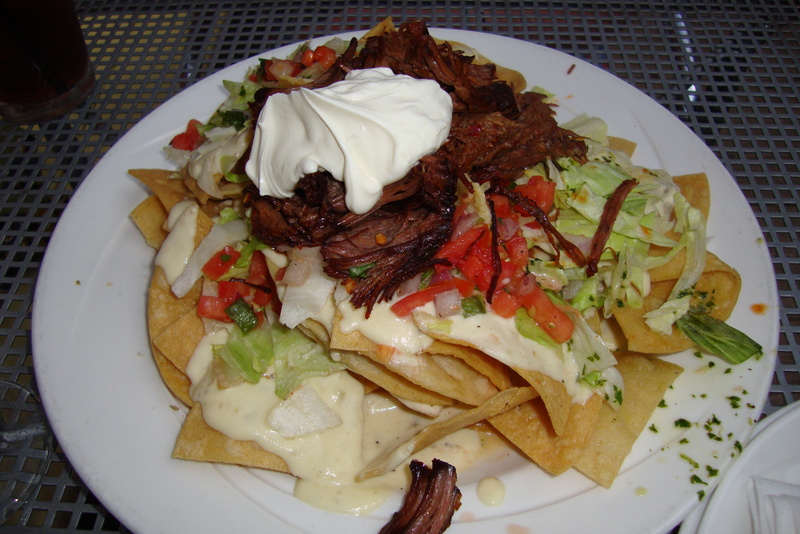 Appearance: ( 8 ) A mound of white chips, topped with globs of white cheese, with a hat of shredded beef and a dollop of sour cream on top. They could have benefited from a little green (aka guacamole) but were still pretty appetizing. Quality of ingredients: (7) The homemade chips were light, salty, and delicious, though they grew to feel heavy towards the end. The beef was the highlight of these nachos: savory, chewy and moist. We just wish that there had been more of it! We soon discovered a layer of refried beans; these were a little on the runny side and had a strange flavor that we soon identified as mesquite. While an interesting and arresting touch, this flavor came to be a little off-putting towards the end. And now, the difficult part of this review: the cheese. We soon realized that the cheese was so pale because it was not, indeed, cheese after all; it was cheese sauce. Normally, Nachopatrol is strongly divided over the use of cheese sauce. However, it must be noted that this was no ordinary canned cheese sauce: thick, slightly spicy, and legitimately cheesy, it was clearly cooked up in-house, and reminded us of the cheesy bechamel one uses in homemade macaroni and cheese. Let it be known: while real melted cheese is always better, this was actually….good. Freaky…while we don’t endorse the idea of cheese sauce, we have to give the Rattlesnake props for actually doing it well. Distribution of Toppings: (7) Even though the cheese sauce was good, it was so thick and gloppy that it really didn’t provide the viscosity that makes cheese sauce seem like a good idea. Even in the warm air it quickly congealed into a substance much less appetizing, and much harder to distribute properly. Once again, the beans were in the middle layer, but they didn’t contribute much to the overall coverage. The beef was in big chunks on top, good for grabbing with a fork, bad for distribution scores. Overall: 28. The Rattlesnake handicapped itself and still managed to defy the odds and put out a decent nacho. Skyler, likin’ the cheese sauce. I feel like I’ve won some victory. Ah… the Rattlesnake. If I remember right that’s the one with the upstairs area with the pool tables. Amazing that I can remember anything from days. My gf at the time wanted to fool around in one of the bathrooms one night, but the other people waiting got impatient and kept banging on the door. Just no privacy in this world.